Malibongwe Nhlakanipho Xaba is a 28 year from South Africa, Known to friends and colleagues as “Mally”, he is an energetic, inspirational speaker, author and youth motivator, who has worked with young people all over Southern Africa. His father left him when he was 2 years old, Malibongwe grow up knowing his granny who played a huge role. 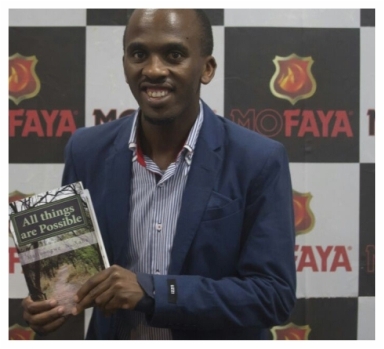 Malibongwe wrote and self-published a book on his Smartphone. In his community, he is recognized as a pillar of strength for young people neglected by both family and community. His project has touched more than 12000 young people this year alone. Malibongwe is an example that it the house you stay in is just a shelter what is important is what you do to make the world a better place. Despite having grown up in one of the poorest townships in South Africa, Malibongwe’s message, always delivered with power and passion, is consistently one of self-love, self-belief, possibility and positive expectation. I sometimes sleep without eating but I will never sleep without doing something that will take me a step closer to my purpose.